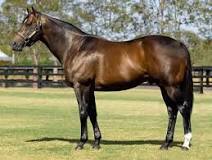 Champion Australian sire Redoute’s Choice died at Arrowfield Stud yesterday aged 22. The stallion had suffered a traumatic loss of mobility which could not be restored. He was euthanised following intensive veterinary care. With three champion sire titles on his record and arguably Australia’s greatest ever stallion, Arrowfield Stud owner John Messara was yesterday left remembering Redoute’s Choice, a horse “who touched many people”. “Redoute’s Choice is such a big part of all our lives, and right now it’s hard to imagine Arrowfield without him,” Messara said. Messara took comfort from the fact that Arrowfield Stud has invested heavily in sons of Redoute’s Choice, headed by his champion sire son Snitzel, Not A Single Doubt, Pariah, Scissor Kick and perhaps his best-performed colt The Autumn Sun, who Arrowfield bought into last October, having sold him for $700,000 at the Inglis Australian Easter Yearling Sale in 2017. Bred by Muzaffar Yaseen of Teeley Assets, Redoute’s Choice was born on August 15, 1996, as the first foal out of juvenile-winning mare Shantha’s Choice (by Canny Lad) and was from the sixth southern hemisphere crop of champion stallion Danehill. He would be retained to race by Teeley Assets, winning five of his 10 starts including four at Group 1 level before being retired to stud in 2000 at a fee of $33,000. As Redoute’s Choice’s progeny began to become a force on the racecourse his fee rapidly increased, from $40,000 in 2004, to $220,000 in 2005 and a career high $330,000 in 2007 and 2008. He covered 45 mares last year at an advertised fee of $137,500. Redoute’s Choice was a champion sire on three occasions; 2005-06, 2009-10 and 2013-14, having been crowned leading first season sire in 2003-04. In the 2013-14 season, Snitzel was runner-up to his revered sire – the first time the feat has been achieved. Fifteen years later, Redoute’s Choice currently lies fourth on this season’s Australian general sires’ table, one that is led by Snitzel, while his first crop son Not A Single Doubt is lying in 11th place. At last month’s Magic Millions Gold Coast yearling sale, Redoute’s Choice had 15 yearlings sell for an aggregate of $8,245,000 at an average of $549,667, which saw him finish second in the leading sire by average with three or more lots sold. Jockey Jimmy Cassidy, who rode Redoute’s Choice in six of his ten starts including three wins, described the horse as a “machine”. Redoute’s Choice won on five occasions including the famous Group 1 Caulfield Guineas (1600m) battle royale with arch-rival Testa Rossa in 1999 and in the Group 1 Manikato Stakes (1200m) early in the 1999-2000 racing season. Cassidy also rode the then two-year-old in his debut win on February 20, 1999, a week before the Blue Diamond Stakes (Gr 1, 1200m). Danny Nikolic won the Blue Diamond on Redoute’s Choice and the colt was the short-priced favourite for the Golden Slipper on the back of his two-length victory over Testa Rossa. He was, however, scratched on the eve of the race due to an elevated temperature and was spelled before returning as a three-year-old.